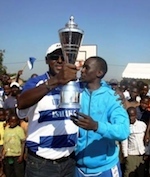 Burundi participate in the tournament of Africa Zone 5 at kampala , Uganda from 20th to 28th August 2012. Burundi will be represented by Urunani ,2011 Zone 5, champion (males), always considered as favorite after his last performance in the previous edition in Dar Es Salaam, Tanzania last year as well as the reinforcement of some good local recruitment as Willy Nijimbere. It will also be represented by the women's Zone 5 Vice-Champion of the previous edition, Berco Stars, accompanied by the formation of Ngozi province ranked second in the National. Note that this tournament is host more than half a dozen countries in East Africa. Another detail is the absence of star New, Urunani great rival in the championship of Bujumbura, and vice champion of zone 5 in 2010 due to lack of funding.